Last week I wrote about how Comcast did not sync with their systems to auto credit people for their free “loyalty movie” and I also encountered a similar problem with Hertz. These two events have shown me that people don’t always think through the potential problems that people could with their newly optioned offers or systems. I love the Hertz gold program – you get dropped off at a big board and there is your name in big LED letters – just like being in Vegas [but with about another 100 people] and tells you where to get your car. You go to the marked spot and bam — there it is your car, the keys, the contract and a map. In some airports they have either turned on the A/C or heater and the car is ready. But, in a brilliant way to maximize their cash flow, Hertz has instituted a program where you can pay now or pay later for the core car fee of your rental. Below is an example of the savings for a week rental in Maui in November. So this most recent experience was on the trip to Atlanta. I had also experienced the same on a trip to San Francisco. I used this same prepay feature to get the discounted price to save some money. The problem is in both cases, my favorite “Gold” membership benefit of passing the line and going straight to my rental became worthless. In both cases I had to go inside the booth with 20+ people who also thought it was a good deal. Why did we not just go to our cars? Well, apparently since we prepaid we needed to go inside and pick up our paperwork. In both places I really wanted to know why we had to come inside – they got their money for the prepay and the rest will be put on the credit card as it always is. It is to show proof of ID – since I could prepay for my minor child to get a car – sounds like a good idea but what about the guy who checks license and contact at the gate – response: oh, they are hired security people and not Hertz employees was the answer. They wanted to confirm that I knew I prepaid so I would not pay the full amount when I brought the car back. Ummm, would the system not catch the prepayment and only show the balance due? To Remind me that I only prepaid the car fee portion was prepaid and not the mountain of airport taxes and fees. So now, for the next Hertz rental I need to decide is the $20 to $40 savings worth the extra 20 to 45 minutes needed to pick up my paperwork rather then just getting to the car and being on my way? People, look at the whole process. If you are adding some great feature that benefits you please check to make sure it does not cause problems downstream for customers. Yes, I am saving money but if the hassle negates the primary benefit of the service and I am frustrated by the change — I will not use it creating a loss for both of us. They have broken the information down into 5 main categories: Macro Economic Trends, Technology, Consumer Trends, Media Consumption and Media Landscape. Within each topic are subcategories focusing on a deeper segment of that category area. For example in the Consumer Trends category they have various segments like community, entertainment, information and ecommerce. The data is relatively recent and not exclusive to the UK. There tends to be more UK and European data than US right now but I am sure this will change. I find it interesting there is not a “Search Category” nor did they have a lot of date from their own research especially from the CPG study that would fit in the Consumer Trends category. Nevertheless, this is a good resource and a quick way to find relevant stats and the source. They even have a link to send them your data. If you are stuck for a stat or hear one and need a source, this is a great place to try. I will monitor it and let you know if they add any additional information. South By Southwest Interactive (SXSWi) opened its panel picker on Monday allowing the community to vote for the panels that should be added to the event. You can vote until September 4th 2009. The actual interactive event will be March 12 – 16, 2010. For those who are not aware, there are also music and film events before during and after the interactive week. When I look at the common element of large companies that are doing well in search marketing I almost always encounter some sort of Center of Excellence (CoE). While they may not always be called a CoE, some call them Search Council’s none the less, they are some sort of centralized information repository or governance on how search is deployed around the world in the organization. The CoE should be focused on improving the content creation workflow practices, compliance levels, policies, support and awareness and measurement across the program. It is also highly focused on building a culture of Search Marketing excellence that will have a measurable impact on the bottom line. Essentially a Center of Excellence brings together varied people and skills that promote collaboration and best practice usage around a specific focus area to drive incremental business results. The COE, to be effective, needs to be an aggregation of multiple disciplines and levels of the organization in order to provide insight into the various stakeholders roles and how they should collaborate with each other in order to be more effective. Measurements & Metrics — CoEs should be able to demonstrate they are delivering the valued results that justified their creation through the use of output metrics. Support — For the specific area of focus, CoE’s should offer support and mentoring to the business lines. The level of support will vary based on ability and resources and organization. Governance – Not be confused with the dictatorship or gatekeeper of a process or strategy but an enabler, arbitrator, and motivator and in some cases the decider of what is the better of two practices. In summary, a Center of Excellence brings together varied best practices in program development, deployment and measurement to achieve better speed to market, consistency and reduced complexity. The quicker the organization adopts this centralized process for information sharing the quicker they will see a more wide-spread adoption of these practices and a reduction to barriers for improving performance in their specific discipline. Note: I think companies that are struggling with social media adoption in their organizations can take a page from the playbook from the Search Center of Excellence and the adopt the same set of principals to deploy their social media strategy. This newly reformulated C-Suite track at Search Engine Strategies San Jose takes the conference to a new level by providing a truly strategic view into the mind of the CMO. With the exception of the last session, the track is agency free. Only actual senior marketers from large and small brands are speaking. Not that agencies don�t have anything to offer in this track, we wanted to hear from the marketer themselves what is happening and why is it just so damn hard to close that digital divide and make search a larger part of the overall marketing mix. I have been knocking a the C-Suite for over 10 years trying to get them to understand search and have been the most successful when I put it into terms they can understand. The C-Suite and the average Search Marketer are in two different worlds and until we in the search community can learn how they think and speak a language they understand we will never gain the mind and budget share search marketing rightfully deserves. As humbling as it is, Search Marketing is just not that important to take up much time in the mind of the CMO. It is not until we can understand and then integrate with those key concerns that we will get deeper into the organization. We have created a special hash tag for the track to start getting questions and comments in advance post them on Twitter using #sescmo. If you have something you want to make sure gets covered, a question for the speakers post it at that hash tag and we will integrate it into the event. The following is my interpretation of the sessions and the link to the actual description. The first session will be a solo session from my previous boss, Brian Fetherstonhaugh, the Chairman & CEO, OgilvyOne Worldwide. I suggested Brian for this session since he has a perspective that is unlike most at a large ad agency and the CMO�s he works with that needs to be shared with the SES audience. Brian�s session will set the stage for this C-Suite track and will provide a strategic view of how marketing is constantly evolving and will define the critical role that search must play. He will describe the Mind of the CMO and what we as Search Marketers must to get time in that crowded space. I look to Brian to motivate the audience and speakers to understand the CMO�s agenda and how we can collaborate with other marketing disciplines and tear down the silos. To understand we need to stop running individual races but join forces and work on passing the baton between activities to increase the performance and return on precious marketing dollars rather than competing for time and budget. The second session of the morning tries to help us understand that illusive mind of the CMO and how they view search to get a better understanding of how we can work to push the right buttons to achieve greater awareness and a larger share of the pie. I will moderate this presentation free session in the form of a Q&A with these senior marketers to really try to understand why there is a disconnect and how we can move forward in a more collaborative manner. The goal of this session is to explore what we can learn from each other. What do we as search marketers have to do to make the CMO�s more aware of the value of search and social marketing activities. The panelists of this session will represent the challenges of the CMO from two viewpoints: the traditional CMO and the CMO who has made the move to digital. The speakers for this session will provide interesting and candid insights into their world that we can all benefit from. I will do my best Larry King to try and pull from them the things that keep them awake at night and what keeps them from spending larger shares of their marketing budgets on digital techniques. Kevin M. Ryan, CMO, WebVisible, Inc.
Fionn Downhill, CEO & President, Elixir Interactive will moderate this session which was one of the most popular at SES New York. Fionn will get to the heart of the issue that Brian will discuss � the CMO Imperative of integrating digital into the overall marketing mix. The session will discuss the popularity of sites like YouTube, Twitter, and Facebook and how brands increasingly need to engage with their customers outside their website. The speakers promise to offer proven strategies for increasing brand awareness and protecting brand equity in today’s socially connected web as well as tactics that can be implemented in today’s resource and budget constrained environment. Sam Decker, Chief Marketing Officer, Bazaarvoice, Inc.
Fionn is up again moderating this next session on how to effectively shift money into search and social media. As I have always said there is �no new money� and we have to demonstrate how we will spend it as well and preferably better as the tactic we took the money from. The speakers for this panel have been chosen since they have successfully redeployed significant resources� from TV, radio and print and into digital tactics and they lessons they have learned around developing a business case, metrics and collaborating with other tactics to get maximum value from their budgets. Eli Goodman, Search Evangelist, comScore, Inc.
With many marketing organizations feeling the pain of financial pressures, pay for performance-pricing models are gaining popularity in search today. And why not, if search and social are the greatest and most effective marketing tactics why don�t we reward performance? In realty it is nearly impossible to do. Brands don�t have or won�t deploy the metrics and infrastructure necessary to truly measure success that would reward the agency. Even if they do have the metrics to demonstrate success many marketers are shocked at how much they actually have to pay in a performance program. While it sounds daunting there is hope. The panelists in this session will cover the keys to developing a successful pay for performance pricing model including a thorough overview of the concept, how it can be applicable to both PPC and SEO, the chief benefits it offers. Moderated by Andrew Goodman from Page Zero Media will ensure attendees will receive actionable advice on the critical success factors needed to make a pay for performance model work, including the role of goals, benchmarking, performance metrics, historical data, scenario analysis, and tracking. I am looking forward to this track to help both senior marketers as well as search marketers understand the role and value of the other and forge new ground, ideas and approaches to better integrating search into the marketing mix for exponential success. Register now to be part of this ground-breaking event! This report was developed by top executive search firm Heidrick & Struggles and Atlanta-based digital agency Digital Scientists to determine current marketing objectives and the role of digital marketing in achieving these objectives. To get these findings they interviewed more than 100 senior executives with decision-making or budgetary authority over their companies’ marketing spending. Hello! I am cutting edge but the very team and activities I am “responsible for” are behind the curve! What is the problem? The research points to a number of things but still does not really directly identify what causes the disconnect between the CMO and the company being “behind the curve”. I honestly have found very few CMO’s to be “cutting edge” or even “digitally savvy” especially in more traditional businesses. I guess in a self-selecting survey you are either not going to say you are clueless or maybe they just don’t know you are clueless about digital marketing. I am not saying all are “less than cutting edge” but if you look at the digital divide of most of these companies it is very apparent there is a disconnect. There are many “cutting edge” CMO’s in smaller companies since they have already found it an effective way to beat the big dogs. This disconnect is actually the root of the problem and why there is not more in digital – the marketing mix. For a CMO to say they are “cutting edge” and yet their company is not is a disconnect in reality since CMO’s set the marketing and advertising direction of the company and if they can’t or are not who is to blame? Almost half the respondents (49%) agreed that it is important for the CMO to be proficient in digital marketing, but only 13% said that their companies had developed the internal talent required to develop and implement growth-generating digital marketing programs. Comment: Ok, here is the little nugget that supports my comments above. ONLY half of the CMO’s think it is important for a CMO to be proficient in digital marketing. Until I get the full report I won’t know the definition of “proficient” but I believe it should be something like – oh, I don’t know – “Understand the strategic implications of digital marketing and fundamentally how the various tactics can be leveraged to achieve marketing goals.” If we take something this generic as a definition, I am amazed, but not surprised, by the statement. I think this will be a great market opportunity for Heidrick & Struggles since once these old school companies start getting their asses kicked by more “insurgent” companies they will wake up and start replacing some of these CMO who don’t respect the power of digital. Those replacements will start changing their equally outdated agencies that continue to advise them down the back roads of marketing. To fill the capability gaps in digital talent within their organizations, 45% of respondents felt that they would need to turn to external partners and agencies. Comment: This is a problem. Since few CMO’s really understand the tactics many will choose agencies that also don’t understand it or that don’t want to shift money out of traditional marketing channels. I have seen way to many agencies who want to “experiment” and “learn” these tactics on the clients dollar rather than having experience. I do think there will an even greater use of small aggressive specialist agencies in the coming days. Many of the F100 companies I was working with at GSI have already started to shift much of the cutting edge digital work to smaller, more aggressive and less expensive digital agencies. I strongly suggest that when CMS’s go and get this support from agencies they really need to make sure the agency has the right skills. Too many large agencies try to cobble together a “hot capability” based on clients asking for it with no real expertise in that area. I think this opens up a huge opportunity for smaller specialist agencies to gain access to large company projects. The survey revealed the top four marketing tactics for growth included: ROMI analysis, website activity analysis, CRM tools, and SEO, while the bottom of the list included video and mobile ads and contests/promotions. Comments: This is a no brainier. CMO’s desperately need to prove to the CEO and Board that they are spending precious resources effectively. Every company I have worked with have many projects going to better show the ROI and performance of marketing and advertising. 1. 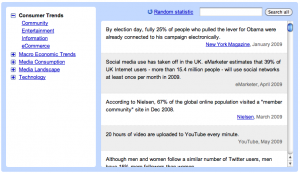 What is the bounce rate of people coming to your site? Don’t know what is a bounce rate? 4. What percent of your traffic is coming from search? Don’t know? I think a lot. 5. What product converts the best online? We don’t sell online. I then asked him why he cared about what people were buying since they don’t sell online. Asked how many leads are going to sales team? He said there were a lot but many were not qualified. I see way too many sites that squander precious traffic and don’t have the most basic understanding of their site and how consumers interact with it. Only 12% of respondents indicated their company was improving the consistency of its marketing and sales communications, and less than a quarter are very satisfied with how their company is conducting ROMI, website activity analysis, CRM, and SEO. Sixty percent of respondents reported that the marketing department has primary responsibility for the all-important analytics, but they want IT to share this load: 44% of respondents want IT to take responsibility for analytics. Comment: I have previously written that this is one of the largest opportunities for agencies is to help with analytics. In my experience 8/10 installations of analytics tools are done incorrectly which is the main reason they are so hard to manage. In every project we have worked on in the past few years we have had to rework the analytics tools just to track the fundamentals. Again, I don’t have the report so I can’t comment on what they want the IT team to do – maybe help install it and get it working so that proper data can come with it. Note to analytics companies – in talking to clients and many at a recent conference the #1 issue and frustration of clients is the lack of adequate training. To clients, most of you have paid a considerable amount of money on these tools and yet they seemed simple to use that you did not invest in the training. Rather than shift the blame to IT or Marketing you should start working on getting it installed and get the right data collected and people trained to mine it properly. With problems at home consuming the attention of the C-suite, expansion into new geographies ranked dead last among all specific strategies cited in the survey, and was seen as very important by only 13% of respondents.